Abu Dhabi Ports has taken delivery of two new mobile harbor cranes which will be used to handle the increasing volumes of general cargo at Khalifa Port and Zayed Port, faster and more efficiently. The new cranes are part of an ongoing upgrade to all of the general cargo handling equipment in Khalifa, Zayed and Musaffah Ports. Both cranes were supplied by Liebherr and were manufactured in Austria. They can lift 65 tonnes, and will complement Abu Dhabi Ports’ existing cranes, which are capable of lifting loads of up to 100 tonnes. 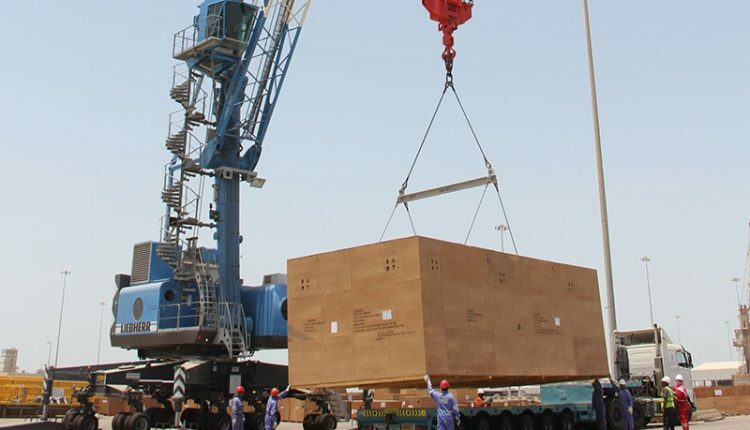 The new cranes were shipped to Zayed Port from Western Europe and specialist engineers from Liebherr flew over to work with the Zayed Port engineering team to assemble and commission the high tech equipment, a process which has taken about a month. The assembly time also served as a familiarisation period for Abu Dhabi Ports staff. The cranes are now fully operational and Abu Dhabi Ports’ engineers are fully trained on the maintenance requirements of the new equipment. Abu Dhabi Ports handled record volumes of general cargo in 2014, a total of 12.8 million freight tonnes, which was a 37% increase on the 2013 general cargo volumes. The majority of this volume is dry bulk cargo and Zayed Port has just received four new hoppers to support this sector further. The hoppers will be used to improve the speed and efficiency of handling dry bulk cargo from the unloading ship into land transport. The hoppers were manufactured by a local supplier York and were commissioned and tested while the new cranes were being constructed. By utilizing the new cranes in tandem with the hoppers, vessel turnaround times will be greatly reduced, enabling the port to handle increased capacity and growing volumes of bulk cargo.